This article is aimed at owners of Restaurants, Retail Stores, Ecommerce Stores, and Service Businesses who sell a selection of products or services. Sell Your Favorite Items, Make More Money, and Enjoy Your Business. You know the old 80-20 Rule: 20% of your items represent 80% of your sales (or profits). It’s probably also true that you like selling 20% of your items more than the other 80%. Because they’re easier (or faster) to buy, make, or deliver. Because you enjoy making, delivering, or performing the service of this item for some reason. Does selling more of your favorite items sound like a nice concept? Well, it’s possible…and it’s easy. Why? because it’s an easy marketing approach and it works. Most businesses show off ALL they can do, and all they have. They’re so proud of their scope of selection, but marketing every THING and marketing to every ONE isn’t usually the best strategy. I know it’s tempting to try to get the most out of your marketing dollar by telling ALL the things you have to offer, BUT focusing on ONE ITEM (or one category), your favorite, can break things wide open for you. The best way to sell anything you want is to get Google’s attention. Even a “little guy” like you can do it. When Google shows your business on the 1st page of search results, you’re going to get more calls, and more customers for that item. Get or Claim you Google My Business Page. Once you’ve done this, fill in all the information as completely as possible. This is a GIFT from Google. Use it. Add photos of your product. Make sure the photos are given descriptive file names. Google can’t see the pictures but they CAN read the file names. It can only help. Add Posts. This is Show & Tell Time just like when you were a kid at school. Show everything and write a description of the photo. Think about the words people (your customers) use when they talk about these things. 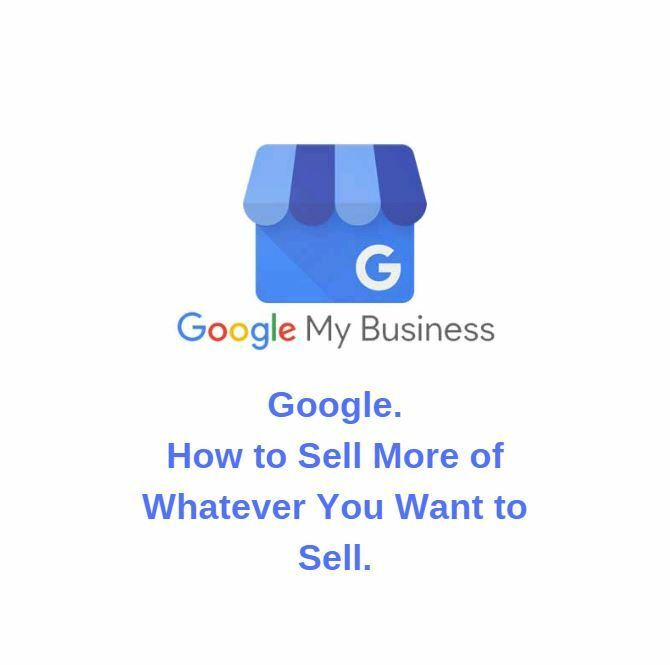 This is your chance to tell Google exactly what you want them to know about your business and your items. Add Info. Here you can add an unlimited amount of detail about every category of product and every item or service you provide. In keeping with the theme of the title of this article, start with the items you want to see the most: the ones you’re famous for, the ones you love, and the ones that make you the most profit. Chances are, only a tiny fraction of your competitors will catch onto this any time soon. This is your chance to get a jump on the rest of the crowd. This process is pretty easy but like anything worthwhile, it takes time and effort. Every product or service you sell, especially the ones you like to sell most, deserve their very own web page. When people are looking for something very specific, whether it’s The Best Blueberry Pie Near Me, or “Install a Whole House Electric Generator in Haddonfield, New Jersey”, the website which has a page dedicated to this ONE product will stand a greater chance of appearing in the search results. Combined with the work I’m recommending in your Google My Business page, this is a powerful 1-2 punch. It’s also a long-term marketing investment that’ll likely pay dividends for years to come. When you invest in building a Rock-Solid Online Presence™, it serves you for years. It’s a long-term investment that pays you back over and over again. In most cases, it even gets better over time. If you need someone to help you along with this, it’s well worth it to get someone with experience and the smarts to understand your business, your products and your audience. (ummm, that would be me and my team, so if this makes sense to you, let’s talk it over. Ask Andrew, CLICK HERE.